The Galaxy S4 was rumored to have new eye-tracking features, and the smartphone does offer a minimal version of that technology in Smart Scroll, which recognizes when someone is looking at the screen; users then can tilt the phone to scroll up and down. Smart Pause uses facial recognition to sense when someone has looked away from a video game or movie they're watching on the phone, and will pause the action. Air View and Air Gesture recognize hand and finger movement so users can swipe and scroll through screens and website pages without actually having to touch the glass. Samsung is pushing the new features as having more of a direct connection to what consumers need and want in a mobile device. That includes the S Translator feature which supports text-to-speech and speech-to-text for communicating in 9 languages; type in a question in English and you'll hear a French translation, for example. The S Health offerings can track calorie consumption and uses the phone's accelerometer to monitor walking/running activity, in a nod to the popularity of devices like FitBit. S Health also plays into a burgeoning Samsung Galaxy ecosystem with wearable accessories that monitor the body's vital signs and will connect via Bluetooth to the S4. 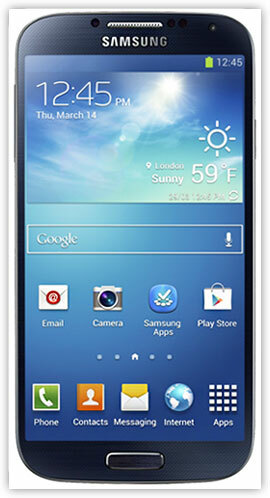 The Galaxy S4 will be available in the U.S. in April from all four major carriers; no pricing was announced. The smartphone is similar to the Galaxy S III, but is thinner and features a 5-inch Super AMOLED HD screen -- larger than both the S III and the iPhone 5 -- with 441 ppi; resolution is 1920 x 1080 pixels. The S4 is powered by a 1.9 GHz quad-core processor and will ship with 16, 32 and 64 GB storage. There is a microSD storage slot. The phone supports WiFi, 3G and 4G LTE and has GPS and near field communication capabilities. Samsung has boosted the camera of its new Galaxy phone; the rear camera has 13 MP resolution, with 2 MP for the front-facing lens. Both cameras shoot video at 1080p resolution. The operating system has Android's 4.2.2 Jelly Bean as its foundation, although there was almost no mention of Google's mobile operating system during the event.